I was never satisfied with my ability to make scrambled eggs. I tried adding milk or water to the eggs, cooking them in butter or bacon fat, with and without cheese, scrambling them in the pan rather than in a bowl, but the end result was invariably disappointing. If I was making eggs, they were gonna be fried or omelets because I could do those much better. Despite my low scrambled egg self esteem, I'd still try to make a batch every once and a while and with a little inspiration from Alton Brown, finally came up with something pretty good. Alton was making scrambled eggs over a double boiler using very gentle heat and stirring quite a bit resulting in tender, creamy looking eggs. I wasn't ready to go the double boiler route, but I tried lower heat and a bit more stirring than I usually do. The result? My wife regularly asks me for "cheesy scrambles", which has supplanted the omelet as her most requested breakfast. 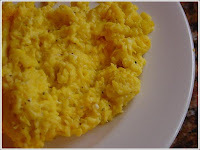 This technique for making scrambled eggs takes about 10 minutes total and results in eggs that are so tender and creamy that you can literally spread them on toast, which is what I usually do. Scramble the eggs and add them to a cold, nonstick skillet coated with cooking spray. Place the skillet over medium-low heat. Tear a few slices of American cheese into small pieces and scatter the pieces over the egg (I like using Land O Lakes white American cheese, but any white deli-sliced American would probably suffice - just don't use individually wrapped singles which have a weird flavor, a gross plastic texture, and make me nervous just thinking about all that unnecessary packaging). A few grinds of black pepper and you're ready to give the whole thing a stir. At this point you let them set for a few seconds then give the eggs a good stir. Continue this pattern of setting and stirring until the eggs begin to form small curds. Keep stirring all the eggs to the middle of the pan and chopping them up with the spatula. The eggs are done when they are all pretty much set and just glistening slightly. I suggest spreading them on some good toasted and lightly buttered bread (or english muffins, bagels, etc). Please forgive the pedantic tone of this but I have to word this carefully to avoid confusing myself. How tough an egg becomes as it cooks is a function of the rate at which the proteins in the egg denature and coagulate. Rapid denaturation and coagulation will produce a hard and relatively dry egg while slow denaturation and coagulation will result in an egg that is soft and moist (provided you don't drive off the water by heating it for hours). This is true of all preparations of egg. So the trick to producing soft and moist scrambled eggs is to always cook them slowly over gentle heat. This is, by the way, standard practice for a classically trained French chef. If Escoffier or Fernand Point were alive today they would tell you the same thing (without discussing the behavior of the proteins, of course) Escoffier was known to test new cooks by asking them to prepare fried or scrambled eggs. Then when they screwed them up by cooking them too fast he'd show them how to do it soigne (neat). Anyway, Alton Brown's double boiler technique is a neat way for a novice to slow cook scrambled eggs but with practice, a clean pan, a low flame and lots of butter you can get the same result in a frying pan. Nice blog! Good luck learning to cook. I've been cooking professionally since 1981 (and for a long while before that) and I'm still trying to nail basic dishes like poached eggs, boiled spaghetti and others. Cooking is a totally Platonic experience -never perfected but always in the process of becoming perfect. Thanks for the comment Bob. It's always nice to learn some background on a technique, and as a science teacher, I love the stuff about the proteins - very interesting.